People often ask me and my wife why we don’t have a dog. The answer is simple really: We had the best dog ever and that was more than enough for a lifetime. It was May, 1986 when my wife and I visited the animal shelter in Agoura, California. We spotted a dog that was among 13 sired by a Labrador Retriever. There were two mothers involved, both Australian Shepherds. Of the 13, my wife immediately lit on one because he was “spunky.” We took the 8 week old pup home and were asked by our son if we had rescued a Harbor Seal. We named him Smokey. The color fit and so did the name. Little did we know that our blue merle Australian Shepherd mix Smokey would be our companion for nearly 17 years. In the first weeks with our new dog, we would have to walk him extensively just to tire him out enough so that we could get some sleep at night. Yes, the dog was spunky. That was an understatement! Super hyper would be a better adjective. His enthusiasm for everything in life was catching. He loved being in the thick of things and he especially loved food, any food. He would eat anything we ate including sauerkraut, ice cream and pickles. His favorite was a hand-fed banana. To this day I can’t peel a banana without a tear in my eye. Several months later, we moved from California to Oregon and Smokey began his life-long relationship with water. 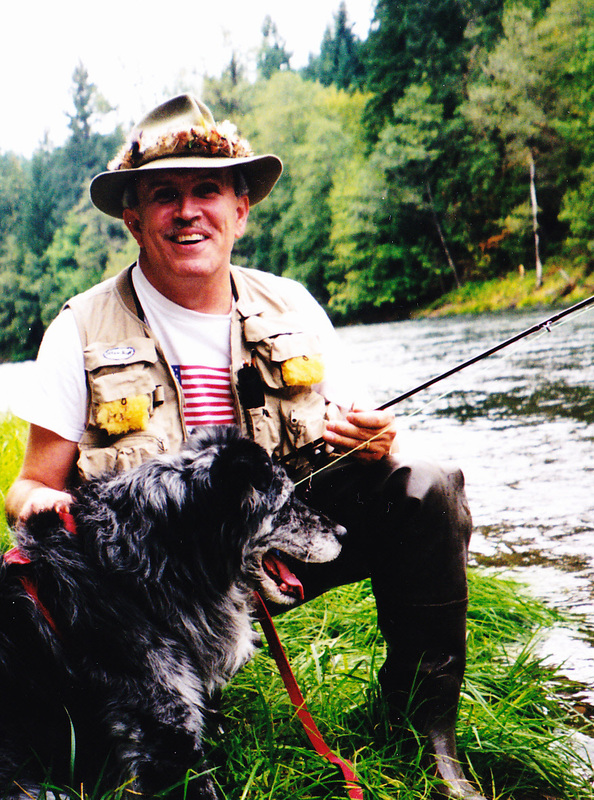 He loved water in any form and soon found that he loved Oregon’s large streams. He was always at my side while fishing and he learned to read the water for trout and salmon like a pro. When he wasn’t on a stream, a puddle seemed to do; anything as long as it was wet! As the years progressed, his favorite place in the world became Black Canyon. This is a stretch of the Willamette River that runs down from the Cascade Mountains and through the city of Eugene where we lived. Black Canyon is a place along the river with a tree-covered campground. It was one of my favorite places to fish as well. Smokey and I spent countless afternoons there together. It was his second home. 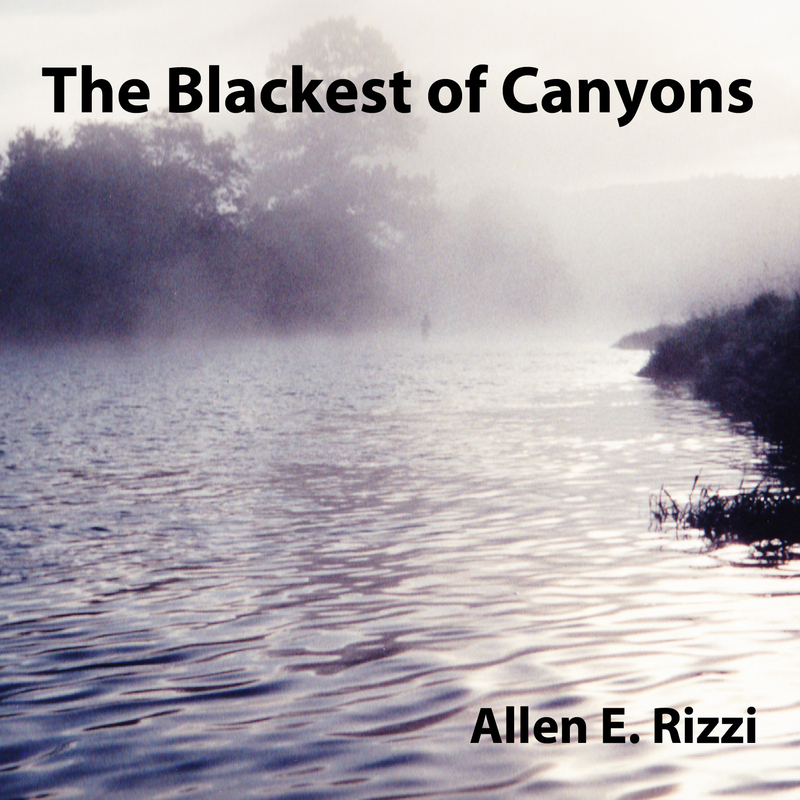 Years later, I would write a novella called The Blackest of Canyons. For a full account of Smokey’s days here, you can find the book here. Smokey, like people, had his quirks. One was to go nuts when he heard the whisper of the lawnmower primer button. How a dog could hear that minute sound from in the house is beyond me. It always set him off and I could never train him not to bark at the lawnmower. I did train him in many other ways. He learned all commands in two languages plus hand signs. However, he often showed-off for our guests by ignoring all commands. He once chased deer but was trained so well not to that a deer could approach our elevated deck and Smokey would just tremble but never bark or lunge. All the while he quietly waited for the “okay” command that never came. Since Smokey thought he was a person, we treated him like a true member of our family. He made more car trips to remote locations all over the Western United States than most people. He loved the road and couldn’t wait to get on it. The new smells of places like Anaconda, Montana were always a lure for Smokey. In each of these far away places, he always found something special, whether it was a sleeping bison in Yellowstone or a simple stick to chew on the St. Regis River in Montana. Home was often on the road and he loved every minute. Smokey was with us in the good times and the bad but like everyone around him, he aged as well. At twelve years, he needed a ramp to get into our jeep. I custom made one with artificial turf so that he could enter and exit comfortably. I also bought him a harness so that he could wade rivers move safely with me while fishing. In short, we treated him always with the respect that we would afford anyone in our family who was aging. I had two parents who were also aging at the time and everyone seemed to understand each other perfectly. My father would spend hours with Smokey at Christmas while my mother often giggled like a school girl while tossing him oyster crackers. But all the while our family friend was getting older. Nothing is for ever. Friends and family die and so did Smokey. He was nearly 17 years old which in dog years is, well, a very, very full life. Do we miss him? Of course! Do we want another dog? Not really. We had the best dog ever! Thanks Joe. Pets ARE people and have always been so in our homes, both here and in Italy. Thanks Paola – I’m glad you enjoyed the post. Smokey is still with us in spirit every day. Furbabies as they’re called in our house always leave paw prints on our hearts but somehow we make room to love another when a loved furbaby leaves us. Never replacing, just expanding our hearts to another child with fur who loves back in return. Thanks for your thoughts KIm. We still just aren’t ready – maybe when we get settled here permanently, who knows? Glad you read this piece. We had planned to take Smokey with us when we moved to Italy but he died before we made the move.